Every gift has a price . . .
Every piece of lace has a secret . . .
My name is Towner Whitney. No, that's not exactly true. My real first name is Sophya. Never believe me. I lie all the time. . . .
Towner Whitney, the self-confessed unreliable narrator of The Lace Reader, hails from a family of Salem women who can read the future in the patterns in lace, and who have guarded a history of secrets going back generations, but the disappearance of two women brings Towner home to Salem and the truth about the death of her twin sister to light. The Lace Reader is a mesmerizing tale that spirals into a world of secrets, confused identities, lies, and half-truths in which the reader quickly finds it's nearly impossible to separate fact from fiction, but as Towner Whitney points out early on in the novel, "There are no accidents." I am puzzled by the good reviews of this book. There really was not much of a story there. Every minor plot, in my mind was left hanging and incomplete. I can't say more without giving it all away but none of it made sense in the end. I was anxious to see what all the hype was about this book and, since I love books set in, or about Salem, MA, this was an easy choice for me. "My name is Towner Whitney. No, that's not exactly true. My real first name is Sophya. Never believe me. I lie all the time. I am a crazy woman. ... That last part is true." As the book opens, Towner, is returning home to Salem and fictional Yellow Dog Island after the disappearance of her Great Aunt Eva, possibly due to foul play. Towner is descended from a long line of psychics who use Ipswich lace to foretell one's future. Without giving too much away, I'll just say that there were many twists in this story. I found parts of the story to be a little slow going. In the end, I thought the author did a good job in closing all the gaps. The premise is interesting enough: a back history involving the Salem witches, the curiosity in lace reading ... and two women who disappeared. But the interest dies soon because the novel goes on and on and on and on and on ... like an astigmatic view of trying to figure out a story from a convolution of words and figures. It must be the feeling of trying to read lace ... while groping for your reading glasses. Things I liked: Barry has a powerful ability to evoke "place." Her descriptions of the locations were masterful. I especially enjoyed the subtle way that she drew us into the more fantastic or fantasy aspects of the story. I found the premises and settings and characters all quite believable. Towner and her Aunt Evie were especially well done. I also enjoyed the way the story flowed along. Its pace was quite well done; I felt neither rushed nor mired down as the story progressed and the elements began to weave themselves together. What didn't I like? (and how to review them without spoilers?) By the time the stories began to draw to a conclusion, I was confused, but Barry had drawn her characters so well that I cared what happened to them. Then, unfortunately, the plot twists overwhelmed both the pace of the novel - more or less just ended with a "revelation." I closed the book thinking - truth! - "OK, what was the point of that?" The book is worth reading if you enjoy immersion in place and character. If plot is important, the book will even satisfy to a degree... so long as you don't demand that it end - um - logically. 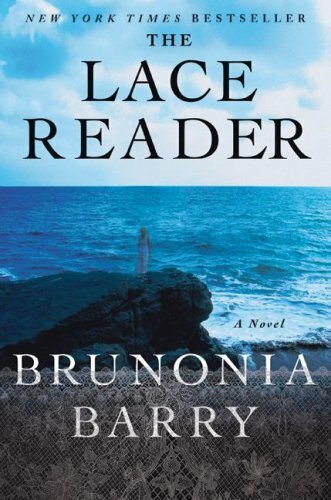 I was lucky enough to receive The Lace Reader, by Brunonia Barry, from a friend's mother as a gift. I'm almost half way into the book, and have found many personally meaningful threads running through the story. For one, the antique lace around which the story is centered brings me back to a textile boutique in the Westminster Arcade I used to frequent in my twenties. I had a penchant for antiques at the time, and collected quite a few hand-made pieces. I remember the owner of the store eschewing the machined lace in favor of the fine handiwork and intricacies of the older lace she offered. It was beyond my understanding how anyone could create such a delicate, decorative piece by hand. Similarly, I've found that Brunonia Barry subtly works fine details into The Lace Reader with seemingly as little effort. I am fascinated by her clever technique of weaving depth into the characters and story line with each turn of the page. I've yet to finish reading the book, but am certain it is well-crafted from beginning to end. I wanted to like this book. I read most of it (skipping a little in the middle). But the theme kept eluding me. Was it a diary of an eccentric New Englander? History of domestic violence and child abuse? A love story with confusing flip flops of desire? A updated treatise on Salem witchcraft? A metaphysical puzzle using lace-making as a symbol -- of something? This novel is an Excellent debut. This is a well-written and engaging page-turner. The women were strong and unique Yankees connected by lace and separated by water in the bewitched historical fishing village of Salem Massachusetts. The story intertwined history, mystery, witchery, social issues, cults, religion, and relationships to tell the story of Sophya Whitney's turbulent childhood. I loved Brunonia Barry's use of imagery, symbolism and her cleaver ironic twists. I wanted another book of hers to read! First Sentence: My name is Towner Whitney. Towner Whitney grew up in Salem, Massachusetts, a town known for the witch trials in the 1600s and where, in the present, witches have become a major economic asset; except to Cal and his group of "Calvinist" religious fanatics. Tower descends from a family of women who read the future using lace as the medium. Having lived in California for the past 10-years and recovering from surgery, she returns to Salem after being notified that her Aunt Eva, who principally raised her, is missing. Coming back to Salem is memories and relationships, including Cal, whom she believes is responsible for Eva's disappearance. The story begins with our being told that everything Towner tells us is a lie and everything told by the narrator is true. It is important to keep that distinction in mind. But rather than it being a lie, it's about memory and a distorted perception of what is true. This changes as the story unfolds. There is a theme of circles throughout the story; the circle of women whether they be the lace makers, the witches or the Red Hat Ladies, and the circle of past and present. For Towner, it's her life, memories and the relationships with those around her. Towner is a fascinating protagonist and certainly unusual. She is a seer and a lace reader, but you never quite know where things stand with her. When young, she and her sister broke into a house and cleaned it. "The kind of thing only a girl would do." It's not the easiest book to follow But it is a compelling story with a wonderful sense of place, wry humor, a paranormal element that I very much enjoyed, and some very good suspense that kept me turning the pages wanting to know how it would end. It's not a perfect book. There were some threads begun and left hanging. But I was reading the ARC and can hope those were corrected in the final version. I may just be curious enough to buy the final to find out. I found this book to be exactly what I wanted to read. Its plot is unique and the subject of the Salem witches, lace makers, etc., set in Massachusetts was perfect from start to finish. There are many twists and turns and the reader will find it hard to put the book down. Read carefully between the lines, there is a lot going on. I have recommended this book to my book club. blah, then good, then, huh? From the cover of this book, to the initial description and title, it seemed like it would be a unique and good read. By page 87 I found myself wondering why I ever thought that in the first place. The person who designed the cover is a marketing genious, yes - covers sell books. I finally finished the book and can't be quite as complimentary to the editor. I think there could have been a good story there, but it really needed to be edited down. Why does the reader need 100+ pages of useless drivel? Really annoying.